HAIL THE KING OF KINGS!!! A dat how dis bredda start up this album…Righteously! After that first one, he starts up something completely different MusicWise but the concious lyrics jus keep a flow!!! Roots Reggae, R&B, Dancehall an even some Pop, well melted togetha as one. Born inna Kingston Jamaica weh di air was always, filled wid di Reggae vibes. 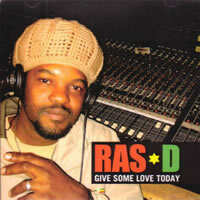 This bredda began writing him lyrics at a young age, so it wont come as a surprise to yuh (him being a social involved Ras) that this new album: "Give Some Love Today” is filled wid concious lyrics. Him a set up him messages inna di music inna perfect style mi tell yuh. Songs included on this album are: Hail To The King, Peace Call, Its A Dirty Habit, Love and Devotion an so many more. An absolute scorcher on all levels! Jah Guidance an Itection be pon yuh all fi Iva I Pray!